This is the state of my studio today. 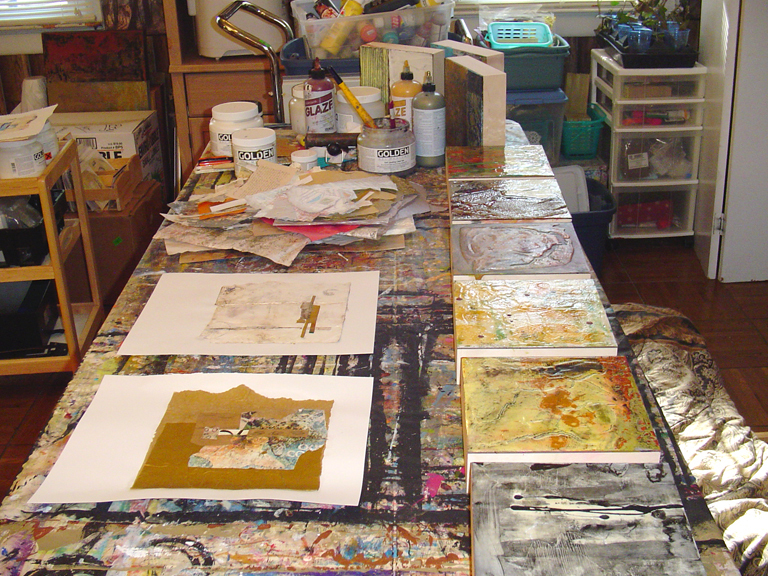 Working back and forth between collage and painting projects may seem chaotic to some, but more and more they are feeding each other creatively. It’s good to be in the studio and refreshed again after a week of family time and then a few more days of canning. The two collages in the left foreground are the ones I’ve just finished. 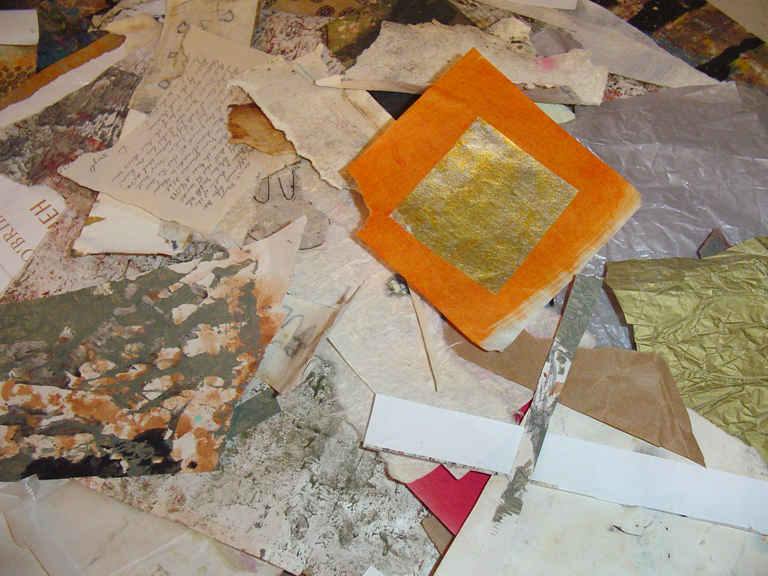 These are the mostly hand made and weathered papers that I have chosen for the current projects. I keep these separate from all the magazine pages and fancier papers, because I want to keep going in this more abstract and textural direction with this series of collages. This is a closer view of the far end of the table, with several gels and mediums that are used both with my panels and with collage, so they just stay out most of the time. Along with that are a couple of colors of Golden glazes. They could probably be put away now. You may notice some of the finished paintings that I’ve shown in previous posts. The ones at the far left end, standing up, are unfinished. 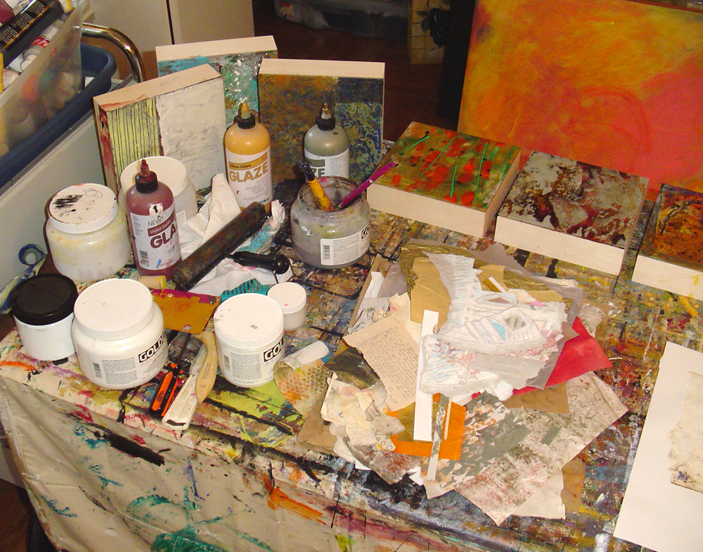 This is a stack of the collages in my weathered papers series, just sitting on top of more jars of gels and mediums. 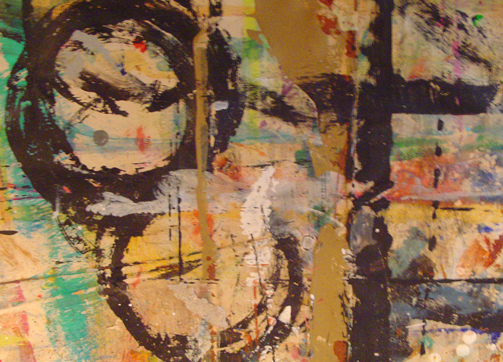 And just for fun, here is a closeup section of my very well-used drop cloth, a recycled shower curtain. The canning projects are under control for the moment, but the cucumber crop is almost ready for another batch of pickles. You sound from your postings as if you have really gone back home to your roots. The gardening and cooking are feeding into your creativity, which I am sure has been enhanced since you settled after the move. It is amazing to have a friend who I feel I know quite well on the other side of the world, could never have happened in pre-internet days. I just so enjoy your posts, the bright spot in my day. Sandra, thank you so much for that. It means more than you know. I too am constantly amazed at how the internet has put us at each other’s doorsteps. It’s a wonderful thing. Hanna, that is a good thing to have. 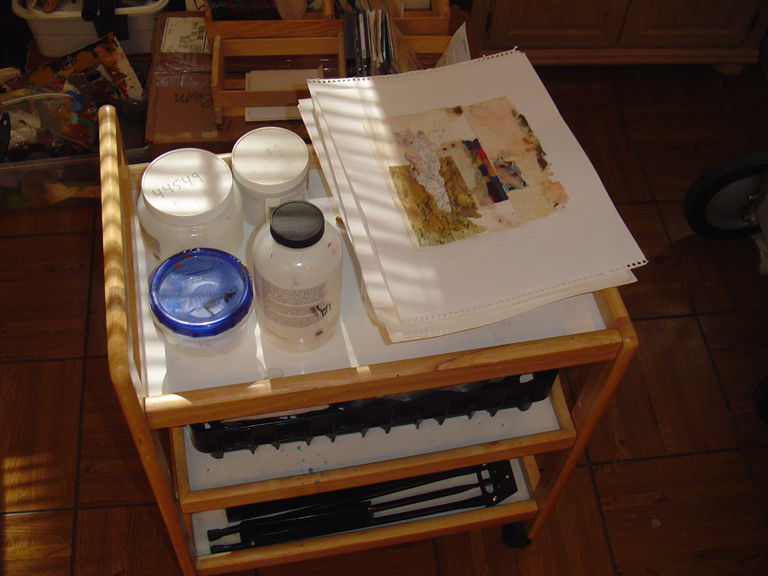 An artist should have at least one space that doesn’t have to be cleaned up! Thank you, Chris. You and I both know we need to grab the creative muse when we can!